It seems most salons have a U shaped galley (open to the center of the boat) located in the front of the salon (N40, KK39, etc) The aft section of the salon is often a L or U settee across from a bench settee. I see many forego the bench to provide room for some recliner type seating (depending on the amount of entertaining done aboard I assume). My question is: why is the galley usually forward with the seating aft? If the salon has windows on three sides, wouldn't one want the L or U shaped settee forward to provide a panoramic view aft while seated? I realize a galley with overhead cabinetry would block some of those views, but I would think a linear or L shaped galley along one side might open up some space while providing a better vista from an aft facing settee, no? I believe the AT365 has a layout like I'm describing. Does a U shaped galley at the front of the salon really improve safety and efficiency while cooking in rough water? For those folks who have a salon layout like the AT365 (or other owners with "non-standard" salon layouts) can you comment on your ability (or your need) to cook in rough water? I think the cabinets would preclude any aft windows, and the door would be in the way. Just curious about how these three layout options would compare to the more common U-shaped galley forward arrangement. I have option A and love it. The galley in the salon design works for boats in that size, and works well. On a larger vessle there is room for a separate galley. Something around 40-42' in a pilothouse design makes for a large enough area on the main deck to divide it into a separate galley and salon without pushing the pilothouse too far forward, which would tend to make the lower cabins smaller. 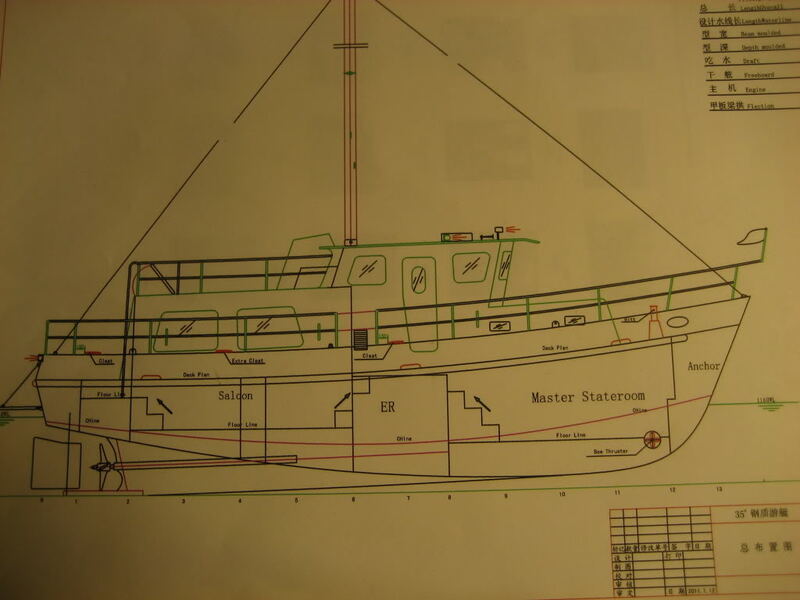 We need to remember that in a pilothouse boat <about 60' we have three areas to work with. We have the main deck area, the pilothouse that is 1/2 story above the main deck, and the lower deck which is 1/2 story below the main deck.. Above 60' you have more flexability as the pilothouse can be a full story above the main deck. The pilothouse forms the transition between these three areas. Push the pilothouse forward and you get a bigger main deck and smaller lower deck. Move the pilothouse back and you get a larger lower deck and smaller main deck. Look at the location of the range. If it is outboard against the hull the unit should be gymboled as a sail boat unit is done, and have fiddles. A pot hopping off the range has a 50 /50 chance of scalding the cook, much un-good. If on an interior bulkhead , just good fiddles will be required. .How the range is done may give a clue as how the assembler thought the boat would be used. If you put the galley aft of the salon, you have a wall at each end of the salon, one for the pilot house, the other for the galley cabinets. This would make the salon look smaller, then if the two walls (pilot house and galley cabinets, were at one end. May I ask your thoughts on the other comments above? Do you use the galley while underway or occasionally in rough water? Is your stove gimbaled, and if not, do you wish it was? Do you wish you had more space to support a separate galley? More specifically, would you trade space in your covered aft deck for more space in the salon (in the form of a separate galley)? Do you wish you had overhead cabinets like are available in many separate U-shaped galleys? Yours seems to be a most logical layout for a salon of that size. Just curious if you have any issues like described above. I've also wondered if folks prefer access to the lower deck from the salon or through the pilot house. I would think having to go from the salon up through the pilot house to get to a head in the lower deck forward would be an irritant while underway, no? But I realize a passageway from the salon to the lower deck also often cuts through potential engine room spaces. I think pilot houses on smaller vessels are pretty much a waste of space (say under 40 feet). On my 40, the galley is down so I don't feel like I am living in my galley and the forward/bar counter doubles as a second eating area where the food is passed up from below and the helm area is included in the salon offering additional seating, storage and visual space. I don't have the built in settee....I have a separate hi/lo table with a click/clack fold down couch with storage in it and a recliner across from it. Just up from the galley is the passup bar with 2 bar stools and a fold up counter. Because the area above the galley and forward head is all open to the front windows the salon has the feeling of being as big as over 1/2 the length of the boat. I bought a POS Albin 40 just for the layout...after living aboard and delivering many boats...I knew the layout I wanted and the only boat I could find that fit the bill and my budget was the one I bought. Also as I get older...I like the trunk style as it's only 3 steps anywhere to the heads, the galley, or a big flat spot before another 3 to the flying bridge (not a difficult ladder to negotiate trying to carry stuff). If you maske the access to the lower decks through the pilothouse, you loose 2-3 feet of dash space. You also have steeper, and or longer stairs. If you make the access through the salon, you loose 2-3 feet of salon wall, and the cabinets you could put there, and have short stairs. My boat accesses the lower deck through the salon. It is a good compromise for my boat. Makes for a very impressive pilothouse. Access is easy, three stairs down to the lower deck, three stairs up to the pilothouse. I want/have both. Access to deck is from either two doors in the pilothouse (port and starboard) and one from the saloon (stern). Separate pilothouse and saloon reduces the helmsman's distractions compared to having a combined arrangement. Must be a huge difference in the two sides of the country... in 35 years I have never had another boat cause stuff to fly while being anchored... nor do I see any need to have or would I want a gimbaled stove on my trawler. On our "coastal" trawler there isn't much cooking while underway (we save that for our calm anchorages). Also it may have something to do with the fact folks on the West coast are a a less uptight and happier bunch and are kinder to their fellow boaters..
Now I will admit.. I have only been doing the trawler thing for 20 years so I guess it can happen. May I ask your thoughts on the other comments above? Do you use the galley while underway or occasionally in rough water? ( Not often but have had no issues when we do, but only when weather permits). Is your stove gimbaled, and if not, do you wish it was? (No it is not and i see no need for it to be, on this boat and others that i have owned). Do you wish you had more space to support a separate galley? (Not at all). More specifically, would you trade space in your covered aft deck for more space in the salon (in the form of a separate galley)?(Nope). Do you wish you had overhead cabinets like are available in many separate U-shaped galleys? (Nope). When we decided on this particular Tug. We looked ALOT of boats. We originally wanted to be in the 40' range. But we didn't find many that seemed as roomy as our 34 does. It feels bigger than it is. One of the things I really liked is that when I'm at the helm I can look over my shoulder, through the salon and have a great view of the stern when docking. This certainly is not my last boat and when I'm ready to move up then these things will change. But for the money I spent and the size of the boat. This configuration works best. For us anyway. I'll echo Hollywoods comments aswell. We have the L shaped dinette with low table one side, opposite a straight settee the other side, (which makes into a pull out double), with U shaped galley for'd to port, and helm with pilot door to strb'd. We feel it makes maximum use of the space, and is very convivial when you can have people sitting opposite each other to eat/converse. Many boats here Downunder now seem to be coming out with the galley aft and all down one side, so all seating is on the other side, with everyone staring into space, so to speak, instead of towards each other. In larger vessels where you have room to have two recliners opposite the settee that would not be such a problem, but that requires a 45 foot plus boat to achieve with comfort in my view. .... In larger vessels where you have room to have two recliners opposite the settee that would not be such a problem, but that requires a 45 foot plus boat to achieve with comfort in my view. I don't think it requires a 45 plus length. Here are two photos of the salon area aboard a Pilgrim 40 footer....two seats and a table opposite the sette that coverts to ta temp berth for guest. And a nice U-shaped galley in front of that, as well as a good size head. The a nice size aft deck out back. The original Pilgrim's had their galley along one side of the vessel rather than U-shaped.